Botox is the most popular cosmetic treatment in the United States because of its ability to make you look fresher and more relaxed. 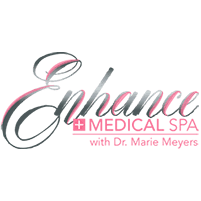 Dr. Marie Meyers at Enhance Medical Spa in Cincinnati is an expert at minimizing your wrinkles while retaining a natural look. To get started on your Botox treatment, call the office today or book online. Botox is a purified protein which inhibits muscle contraction. Repetitive muscle movements can cause lines to appear on the face, which cause you to look angry, tired, or simply older than your age. By relaxing the muscles, Botox makes the skin appear smoother. Botox has a long safety history. It has been used since 1989 to treat medical conditions such as strabismus (crossed eyes). The FDA approved it for cosmetic use in 2002, and just completed an extensive safety review in which they found no serious complications from the very small cosmetic doses. Millions of patients have now been safely treated. There are two common reasons why Botox is sold at bargain basement prices. The first is because it may be diluted. The second and more dangerous reason is because it is not genuine Botox. Counterfeit Botox can not only be ineffective, but also dangerous. In November of 2004, four patients became paralyzed after being injected with fraudulent Botox that was too potent. Non-FDA-approved Botox may not have been manufactured, stored, or transported under proper conditions. The FDA continues to warn doctors about the dangers of fraudulent Botox, and a too-good-to-be-true offer probably is. Dr. Meyers only uses genuine Botox. What can I expect from Botox treatments? Dr. Meyers is very gentle and uses a tiny needle which causes little discomfort. The most common areas treated are between the brows, across the forehead, and along the crow’s feet. A treatment takes less than 10 minutes and there is no downtime. The muscles will begin to relax within 2-7 days, and the effect lasts an average of 4 months. Some people find it lasts longer with repeated treatment. What about Botox for migraines? Botox has been used for migraine headaches for many years. While not all migraine sufferers are helped by Botox, it has certainly been a great answer for some patients. What about Botox for depression? Recent studies have suggested a lessening of depression in those treated with Botox. It is postulated that the inability to frown feeds back to the brain and impacts our emotions. Late-stage clinical trials are now underway to see if Botox can be clinically recommended as a treatment for depression. In a recent survey, 97% of patients were pleased with the results of their treatments. Book an appointment now and see why so many people love Botox.